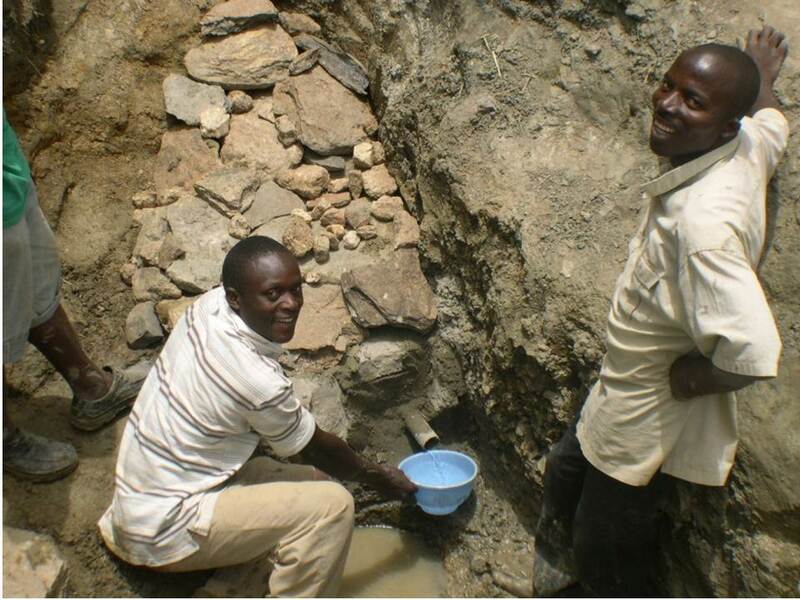 Christians and Muslims are joining together to make water accessible in their communities in Plateau State, Nigeria, where water is a cherished resource - Photo by Sung Lee. Reverend Sung Lee sits under a leafy mango tree with the village leaders, escaping from the blistering Nigerian sun. They make up a strange picture: Muslim leaders from the village on one side, Christian leaders on the other and a Korean man seated in the middle. This meeting has been three years in the making, delayed by the groups' differences. But the impetus for their meeting is the pressing need for a critical resource: clean, abundant water. In Plateau State of Nigeria, a place where water is scarce, it is bringing peace in new ways to long-entrenched religious divides. When SIM cross-cultural workers Sung and his wife Jae Ok first arrived in Nigeria in 1991, it was under very different circumstances. With a background in theology, Sung knew his calling was to teach. At first he taught at an ECWA Bible college for local Christians, but soon realised that wasn’t enough. They wanted to expand beyond the city into rural areas to equip local ECWA missionaries closer to their villages. A training centre took shape through this realisation, located in a place where Christian communities from the south, and Muslim communities from the north intersect. But come dry season, Sung realised there was a major problem: water. “We built our centre but realised we didn’t have a well – and it would be very difficult to build one,” Sung says. Their solution came through an informal meeting that would dramatically alter their ministry. In 1999 Sung and Jae Ok met a short-term cross-cultural worker with a water engineering background. As Sung's standing in the region improved, Muslims and Christians alike began donating and selling land at a discount for the spring projects - Photo by Sung Lee. 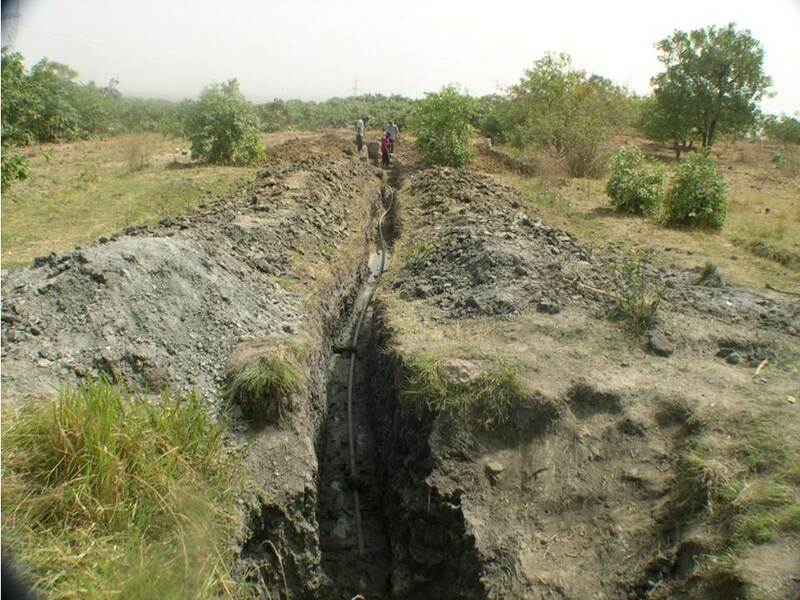 The Canadian worker helped Sung with his water needs, training him how to utilise water from a spring and build the simple infrastructure to store it. Sung realised the power of water to connect people, and since then he has helped many communities find and develop their own local springs, helping Christians and Muslims work side by side to manage their water together. The way forward wasn't always easy. In 2008, Nigeria exploded with religious conflicts – Christians and Muslims came against each other in deadly clashes. Sung and Jae Ok suspended their Bible courses because it was too dangerous for the students to travel. Despite rampant vandalism and acts of violence, their centre was never disturbed, because of their strong relationships in the region. Buying land in Nigeria brings its own set of complexities. Building a spring requires the purchase of a small plot of land around the water source. At first locals were hesitant to sell the plots, or tried to exploit them by raising the price. But over time their standing in the region improved, and several plots have been donated or sold specially to them at a discount by Muslims and Christians alike. Developing a gravity-fed spring uses simple materials and costs $700 to $7,000 USD. The springs feed into storage tanks, providing continual water for a village. After a spring is built they always hold a dedication ceremony with the entire village. During the service they pray in Jesus’ name, and wash the feet of the Muslim and Christian leaders, telling them this is what Jesus did for his followers out of humility and love. Though he has done the technical work on his own, Sung now trains local Christians to manage and lead new water projects in other villages. After the springs are built, local missionaries continue to contact non-believers and build relationships in the communities. Sung sits with the village leaders under the shady mango tree and sees progress. After three years they seem ready to work together to help their community. He tells them each side must cook a meal for the other side before the spring is built, to set the relationship on a better foundation. Jesus said, “Whoever drinks the water I give them will never thirst. Indeed, the water I give them will become in them a spring of water welling up to eternal life” (John 4:14). Spring by spring, Sung and Jae Ok are helping their community, providing physical water while pointing to the One who brings spiritual water and reconciliation. 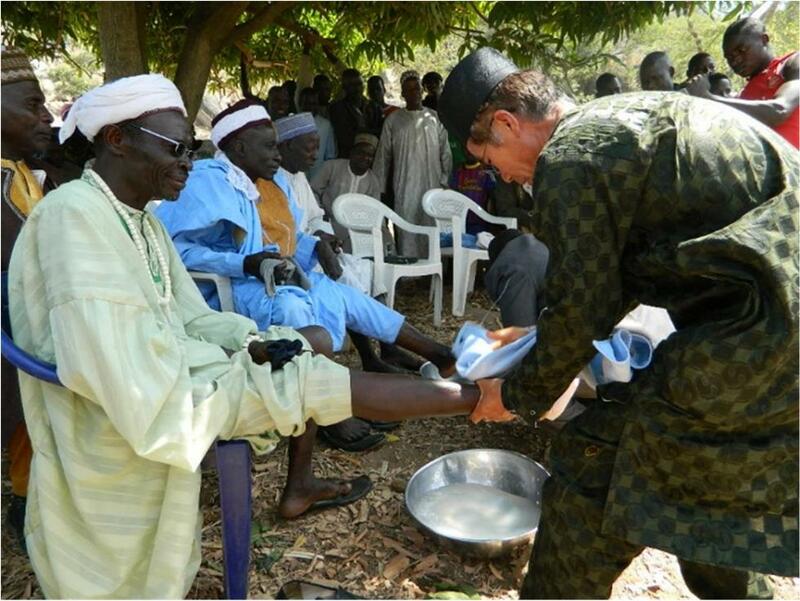 Sung washes the feet of village leaders, something they do at the dedication ceremony of every spring - Photo by Sung Lee.